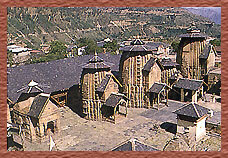 CHAUGAN: The Chaugan is the heart and hub centre of all activities in Chamba. Tradition is silent as to its use as a polo ground and the name is etymologically distinct from Chaugan, the Persian name of Polo, being of Sanskrit origin and meaning 'four-sided'. Initially the five Chaugan were a single patch of meadow. In 1890s the leveling of the Chaugan was done. It became a public promenade and Cricket ground for the British. Annual Minjar Mela is held in the Chaugan. Local people can be seen promenading in the Chaugan till late night. AKHAND CHANDI PALACE: Construction of this residential building of the Chamba family was started by Raja Umed Singh sometimes between 1748-1764 AD. The place was rebuilt and renovated during the reign of Raja Sham Singh with the help of British engineers. The Darbar Hall (Marshal Hall) was built in 1879 by Capt. Marshal and the Zanana Mehal was added in the reign of Raja Bhuri Singh. The subsequent additions and alterations clearly betray the Mughal and the British influence. 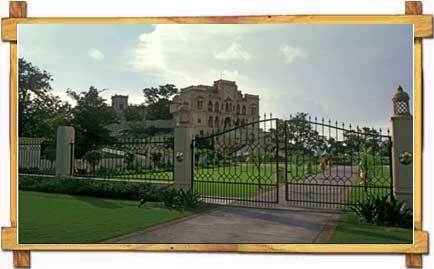 In 1958 the Palace building was sold by the descendants of the royal family to the Himachal Government. The latter handed it over to the Education Department for the purpose of starting a Government College and District Library. The palace has a commanding view of the Chaugan, Laxmi Narayana Temple, Sui Mata, Chamunda Devi Temple, Rang Mehal, Hari Rai Temple and Bansi Gopal Temple. All local site seeing can be done on foot in Dalhousie. The main tourist attractions are Panchpula, Kalatop and Khajiar lake. PANCHPULA: Panchpula, a beautiful spot, is barely 3 kms. from G.P.O. On the way to Panchpula is Satdhara springs gurgling with refreshing water, believed to contain some medicinal properties. Panchpula stream is the main source of water supply to Dalhousie and Bahloon. The stream springs from the north side of DayanKund and runs down a picturesque ravine to the waterworks of Panchpula. There is an elegant monument erected at Panchpula where several streams meet at one point. This monument, a samadhi was built in memory of great revolutionary Sardar Ajit Singh who breathed his last in Panchpula. There is a Tourism restaurant and several chai shops in Panchpula, that offer hot and cold beverages and snacks. KYNANCE: Kynance is a private residential building of Dharamvirs. This building was constructed during the year 1933 by Dr. N.R.Dharamvir of Lahore. This building acquired historical significance due to the reason that Neta Ji Subhash Chander Bose, a class fellow of the wife of Dr. Dharamvir, stayed with them for a period of 7 months beginning May, 1937. Before arriving in Dalhousie, Neta Ji was in British Jail where his health had deteriorated. On the request of his younger brother the British High Court released Neta Ji on parole on health grounds. It brought Neta Ji to the climate of Dalhousie. Kynance is barely 50 kms. from G.P.O. It lies hidden from the public eye below the road. An insignificant looking board bearing the name of Kynance hangs from a tree and is discernible to only those tourists who have an eye for details. SUBHASH BAOLI: Just approximatly 1 km from G.P.O. is a charming natural spot called Subhash Baoli. Neta ji Subhash Chander Bose during his 7 months sojourn in Dalhousie in 1937 is believed to have spent most of his days by the side of this water body, meditating amidst dense woods of Cedar and meeting his party workers. This place lies on the G.P.O. - JandriGaht Road. A canopy with seating facilities has been created by the local administration at this place. ST. ANDREW'S CHURCH: St. Andrew's Church commonly known as the Church of Scotland was built in the year 1903 at Baloon by Protestant Christians. The Church is approximately one and half kms. from Dalhousie's bus stand. The Church building is in good condition, recently a brick boundary wall has been erected around it to save the building from mischief mongers. ST. PATRICK'S CHURCH: This Church is situated in Baloon, Dalhousie Cantt., on Military Hospital road approximately 2 kms. from main bus stand. 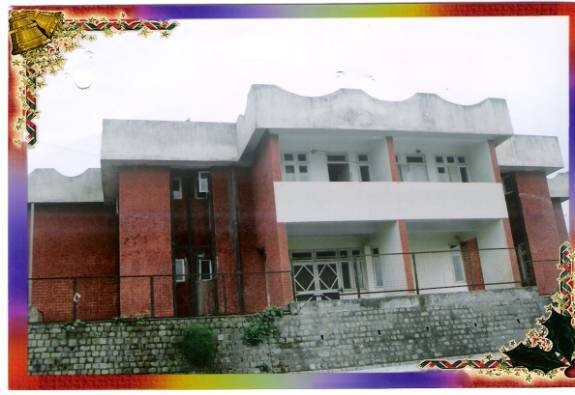 St. Patrick's Church is the largest church in Dalhousie having a seating capacity of 300 persons in its main hall. The Church was built in the year 1909 and the dressed-stone building is still in good condition. This Church was built exclusively from contribution made by officers and ranks of the British Army. At present the Church is managed and maintained by the Catholic Diocese of Jalandhar. ST. FRANCIS' CHURCH: This Catholic Church is a very prominent monument on the Subhash Chowk. This Church was built in the year 1894 from the contributions made by Army and Civil Officers and Civilians. This Church is managed and maintained by the Cathoilic Diocese of Jalandhar. St. Francis' Church on Prtrain hill is believed to have been built on the lines of a certain church in England. Beautiful glass work and intricate stone work can be seen in the Church. Service is conducted every Sunday. By the side of the Church is the residence of the Priest. The building is called Alverna better known to the local people as "Lambe Chole Wale Padri Ki Kothi". ST. JONH'S CHURCH: This Church stands on the Gandhi Chowk approximately 2 kms. from the main bus stand of Dalhousie. This Church was the first to be built after the town of Dalhousie was founded. Prior to 1863 a wooden structure stood at this place. The idea to build a stone structure took birth with the arrival of Rev. John H. Pratt who came to Dalhousie on 11-04-1863 and inspired the Christian community to build a permanent church building at this place. Building of this church is a copy of Roman Catholics church of England but this church belongs to Protestants. The church building stands in a good condition but its surroundings demand much better care. Service is conducted on every Sunday. LAXMI NARAYAN TEMPLE: This temple is dedicated to Lord Vishnu and was built more than 150 years ago. The temple enshrines a beautiful image of Lord Vishnu. The temple is frequented by local devotees. 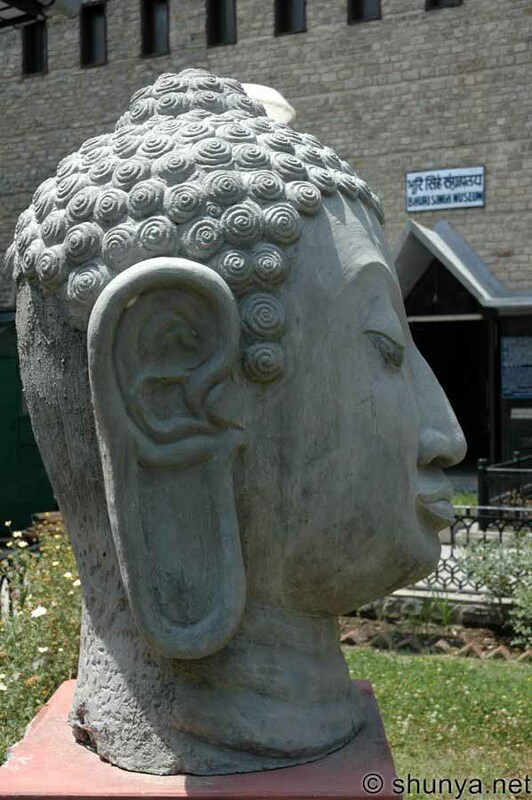 The temple is located in Sadar Bazar approximately 200 mtrs. from Subhash Chowk. RADHA SWAMI SATSANG BHAWAN & HOSPITAL: Dalhousie holds great significance for the followers/ disciples of Radha Swami sect of Beas (Punjab). This Satsang Bhawan is situated near Moti Tibba 300 mts. from Gandhi Chowk (G.P.O). In recent times many people from the nearby villages of Dalhousie have embraced the Radha Swami Sect. Every Sunday from 10 AM to 11 AM Satsang is held in the above cited premises. The Present Radha Swami Chief Maharaj Gurinder Singh Ji visits Dalhousie twice a year. Even the Late Maharaj Charan Singh Ji was very fond of Dalhousie. It is believed that Baba Swarn Singh Ji was enlightend in Dalhousie. SHIVKUL: Shivkul is an Ashram of Vimala Thakur, a re-knowned religious philosopher lady from Gujarat. Shivkul is on the Mall Road betwen Gandhi Chowk and Subhash Chowk. From here one can enjoy the beautiful panorama of Pir Panjal Hills, connecting Chamba Distt. with Jammu & Kashmir. During summer when Vimala Hi popularly known as Vimala Bahen comes to Dalhousie many foreigners as well as Indian disciples of Vimala Ji from all parts of the coutry and abroad gather in Dalhousie to attend her lectures on spiritualism. DAKSHINA MURTI: Dakshina Murti is a yoga institution created by Dr. R. P. Kaushik of Sonepat/Delhi during mid seventies. Dr. Kaushik travelled all over the world to teach yoga and spiritualism. He died in July 1987. His followers still come to Dalhousie and stay at Dakshina Murti 200 mts away from Subhash Chowk on the small Mall known as Garam Sarak. NORWOOD PARAMDHAM: Norwood is a beautiful House situated on the east of upper Bakrota Hill of Dalhousie. This house is also known as Kainth Wali Kothi is a local name given by people of Dalhousie. Approximately 5 kms from Gandhi Chowk on the Bakrota Mall, the kothi is surrounded by thick forest of deodars. During 1925 a young Yogi Swami Satyanand came to Dalhousie and stayed here. He meditated here and took a silent vow that he will not break his fast till he finds the truth and God. After fasting for a month Swami Ji was enlightened with "Ram Naam". He called this place Tapo Bhoomi. After this enlightenment he wrote some noted books like Ramayana, Geeta Parbachan, Bhagti Parkash, Amritvani. He died on 30th November 1960. After his death a very close follower of Swami ji Bhagat Hans Raj Ji of Gohana is organising Satsang at Norwood presently known as Param Dham also called as Ram Ashram. Thousands of people from all over the country come to Dalhousie twice a year to attend Satsangs. About 250 people can stay at a time here when satsang is conducted. BANIKHET: Seven kms short of Dalhousie is Banikhet - the gateway to Dalhousie. At Banikhet the road bifurcates for Chamba and Dalhousie. This small place has gained importance with the setting-up of residential colony of Chamera Hydro-electric Project. There is a PWD rest house at Banikhet. A Nag temple in Padhar Maidan now called mini stadium is a place of worship for the people of Banikhet and villages around. The temple is approximately 150 years old. KALATOP: Kalatop and Khajiar are best explored if you take a three days walk from Dalhousie to Kalatop, Khajjiar and back Dalhousie.The trek is more or less level and requires good health, a pair of sturdy walking shoes. Kalatop is 10 kms from G.P.O. at an altitude of 8000 feet. Walking along the secluded and forested road through upper Nakorota hills, one reaches Lakkarmandi. Between G.P.O. and Lakkarmandi lies the Dalhousie water system, Tibetan Handicraft Centre and Dalhousie Potato Farm at Ahla. Lakkarmandi is nestled between 8600 feet high DayanKund peak on its right and Kalatop on the left. Dayan Kund has military installations and is closed to civilians except the local people who visit Bhulwani Mata temple near DayanKund. Lakkarmandi is home for dhogri families that are engaged in charcoal making. Most of the dhogris have been driven to plains because of the fall in the demand for charcoal. At Lakkarmandi there is a Wildlife Barrier to check movement of vehicles on the unpaved but narrow level road that runs 3 kms to Kalatop Forest Rest House. The walk from Lakkarmandi to Kalatop is through dense forest of pines and deodars. The solitude is occasionally broken by singing birds. The blissful solitude of Kalatop is ideal for the honeymooners. Permit for the rest house is obtainable from DFO, Wildlife, Chamba. KHAJIAR: 23 kms from Dalhousie by road and 13 kms from Kalatop is the mini Switzerland of India at a height of 6400 ft. Hutchison writes, "Khajjiar is a forest glade of great beauty, 6400 feet above sea level". Khajjiar is often reffered to as "Gulmarg of Himachal Pradesh". The lush green meadows are surrounded by thick pine and cedar forests. Grazing herds of sheep, goats and other milch cattle present a prefect pastoral scenery. There is a small lake in the center of the saucer shaped meadow which has in it a floating island. Much of the lake has degenerated into slush because of heavy silting during rains. Still the landscape of Khajjiar is picturesque and a photographer's delight. 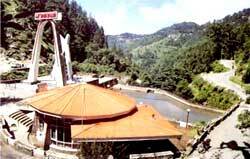 There is a Tourism Hotel and some Tourism cottages at Khajjiar where the tourists can stay . Besides there are two rest houses one each of P.W.D. and Forest Deptt. A couple of private hotels have also come up, which do not match the above places in terms of location and amenities. Bus service to and from Khajjiar is limited and timings change according to local demands. There used to be a golf course in Khajjiar which is not maintained. The best entertainment in Khajjiar is to walk around the lake or to go for long walks in the thick pine forests. Children enjoy this place because of the freedom of movement and the slopy terrain which permits them to roll down to the lake without getting hurt. Another attraction like any other hill station is horse riding. On 07-07-1992, Mr. Willy t. Blazer, Vice Counselor and Head of Chancery of Switzerland in India brought Khajjiar on the world tourism map by christening it "Mini Switzerlan". He also put a sign board of a yellow Swiss hiking footpath showing Khajjiar's distance from the Swiss capital Berne-6194 kms. Khajjiar is among the 160 locations in the world that bear topographical resemblance with Switzerland. The Counselor also took from Khajjiar a stone which will form part of a stone collage around the Swiss Parliament to remind the visitors of Khajjiar as Mini Switzerland of India. BHARMAUR: 65 kms from Chamba is the land of legendary Gaddies, i.e. Bharmaur. Known as Brahmpur in the 6th century, was the seat of power of Chamba state for some 400 years till AD 920, when a new capital was founded at Chamba by Raja Sahil Varman. Bharmaur is known for some very old archaeological remains, primarily the temples. All these temples stand on a level area which call the Chaurasi after the 84 Siddhas who are believed to have meditated in Bharmaur over 1000 years ago. These Siddhas hailed from Kurukshetra and visited Manimahesh. 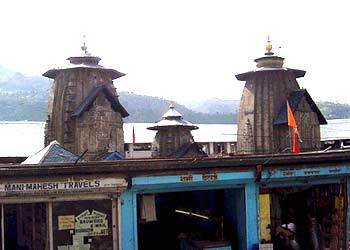 The oldest temples in the complex are those of Lakshna Devi and Ganesh. Both these temples are made in the hill style with gable roofs and rubble masonry. The outer facade, the inner facade of sanctum, circum ambulatory path and the ceiling are exquisitely carved. 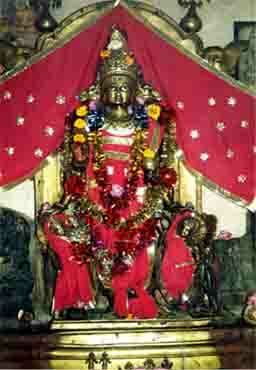 The idol of Lakshna Devi in her incarnation as Mahisasurmardini is magnificent. 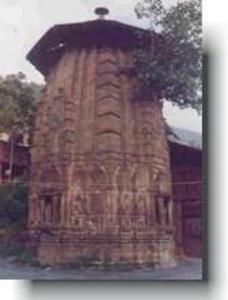 The tallest temple in the whole complex is of Manimahesh built in Shikhara style of architecture. The temple has a Shivalingam on a raised platform. The other temple in Shikhara style is of Nar Singh. Lord Vishnu in his avtar as Nar Singh has been cast vividly. There is a bronze Nandi of life size which stands facing the Manimahesh temple. Inscriptions on the pedestal of the bull and on the idols of Lakshna Devi and Ganesh date back to the reign of Raja Meru Varman. These idols are believed to be the work of master craftsman Gugga. There is a small water source called Ardh Ganda in a corner of the temple complex. Bathing in its water is considered religiously significant. The country around Bharmour is regarded as belonging to Shiva and is sometimes called Shiv-Bhumi. Being the home of nomadic shepherds Gaddies it is also called Gadderan. Just 4 kms above Chaurasi temples is the hill temple of Bharmani Devi. A trek to this temple refreshes the visitors as it unfolds the green woods before him. The best period to visit Bharmour is between July and September. There is PWD Rest-House and a Lodge for accomodation. A number of hotels, sarais and a mountaineering hut with dormitory facility for 26 persons is coming up at Bharmour. There is a regional centre of Mountaineering Institute, Manali, where courses are conducted by qualified trainers. Bharmour is also known for its delicious apples and local blankets. MANI-MAHESH: In the month of August/September the famous JATRA of Mani-Mahesh commences from Laxmi-Narayana Temple in Chamba. The CHHARI is taken to the sacred lake of Mani-Mahesh, which is one of the chief tirthas in the district. Off late people from north India and beyond have started visiting this sacred lake. According to an estimate nearly one lakh people visit this sacred lake every year and take a holy dip. The lake is situated at the height of 13,500 feet above sea level and at the base of Mani-Mahesh Kailsah peak (18,564 feet). Mani-Mahesh kailash is a virgin peak. In 1968 an Indo-Japanese team led by Nandini Patel made an unsuccessful attempt to scale the peak. The devout attribute the failure to the divine prowesses of the holy mountain. On the margin of the lake is a small marble Shivlaing called CHAUMUKHA. Mani-Mahesh is 35 kms. from Bharmour. During mela days efficient bus service is available upto Hadsar. The pilgrimage is generally done in two stages. First camp is set-up at Dhanchho. Several grazers can be seen grazing their sheep in the alpine pastures of this place. the ascent from Chanchho to Mani-Mahesh lake is difficult in patches. Just short of the lake is Gauri Kund where women take a holy dip before returning to home. The pilgrimage to Mani-Mahesh is considered sacred like that of Amarnath, Badrinath and Rameshwarm. During the mela days several BHANDARAS are set-up for the benefit of pilgrims and meals are served free of cost. Pack animals are also available for those who do not want to carry their luggage themselves. 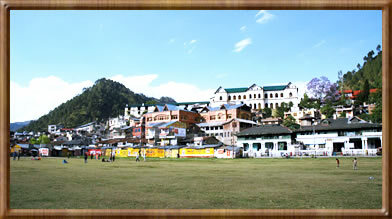 CHHATRARI: 45 kms from Chamba via road is this famous village of Chhartrari. The village is inhabited mostly by the Gaddies who are semi-postral lot engaged in rearing of sheep and goats. This village, situated at a height of 6000 feet, its famous for its remarkable hill-style temple of Shamti Devi. The temple of Chhatrari is regarded as one of the holiest ones competing with well known temples of "Lakshna Devi" at Bharmour and of "Bhawani" at Kangra. The construction of the temple is simple. It consists of a small Cell or sanctuary in which one of the rare brasses by the master craftsman Gugga is enshrined. The walls of the temple are built of rubble masonry alternating with beams of wood. The structure is surmounted by a sloping roof of slate. The roof is supported by richly craved wooden posts which form a VARANDAH or circumambulatory path round the sanctum. The Shakti Devi temple is of interest owning to the elaborate decoration of its facade, ceiling and pillar. The sanctum, its architecture and sculpture betray a conscious effort on part of its builder to introduce a highly refined post Gupta art in this remote part of Chamba. The main idol in the temple is that Shakti. This fine brass statue, 4 feet 6 inches tall shows Shakti holding in her hands a lance (Power, energy) and a lotus (life), a bell (aether, space) and a snake (death and time). Besides this main idol there are almost thirty other small figurines of tutelary deities like Annapurna. Some of these are believed to have been brought from far South or the State of Orrisa. According to the inscription at Chhatrari the temple was built by Raja Meru Varman, by whose order the inscription was engraved alongwith the names of his father, grand father and great grand father as well as that of the sculptor. This epigraph commemorates Meru Varman's victory over his rivals with the help of the Devi. The outer walls of the sanctum are covered with frescoes which are of recent origin and represent scenes from PURANAS. 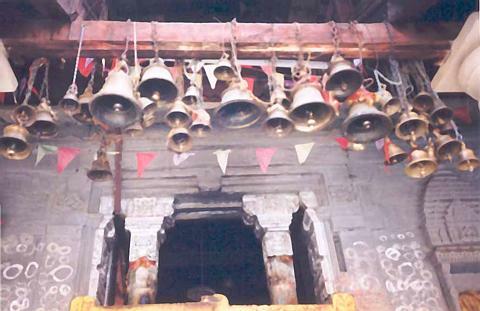 Near the Shakti Devi Temple is the temple of Gauri Shankra. The stone image of Gauri Shankra is of later origin. The work can be attributed to the 10th century AD which indicates a long period of sculptural activity in the region. A few minutes walk up the mountain slopes from the main village is the Charauta temple which houses a stone image of BHATOD NAG who gives water to the people in return for one black and four white goats every three years. There are two interesting legends connected with the village. Villagers had to fetch water from a nearby village call Makain. Once, a Chela of a siddha while carrying water fell prey to bears. The Siddha invoked the deity to solve the water problem. Inspired by the Devi he made 36 marks with his trident at different places in the village and water gushed out from the points where the marks had been made. There are 36 water sources in the village around which beautiful PANIHARS (Fountain slabs) can be seen. According to J. Hutchison the village was named Chhatrari at a later date when Raja Bala Bhadra (1589-1611) made a grant of 36 LARHIS to the temple following an accidental death of a cow at the hands of the Raja. One larhi is equal to three acres of land and such Lahris are today known as Chhatrari. In the month of September a mela is held on the third day after the mela at the Mani-Mahesh lake whence a man brings a Lota of water with which the idol of Shakti is bathed. On this day a number of sheep are slain to appease the goddess and to invoke her blessings. After the prayer the gaddies in their traditional costumes dance to the tune of local music. The village is approached either from Gehra from where a bridle path leads to Chhatrari or from Luna-Ka-Pul from where a steep trace is to be ascended to reach the village or by the motorable road, experiencing a scary ride almost 700 to 900 feet above the river Ravi as one nears the village. The ascent on foot is most rewarding as the visitors are welcomed by lush green fields and orchards at the outskirts of Chhatrari. Chhatrari looks most scenic during September and October. Even on other occasions, particularly in spring, Chhatrari offers pleasant scenery.